I’m hoarse and exhausted after watching the Seahawks amazing come from behind win in the NFC Championship. So here’s a quick blog explaining some of the sayings surrounding the Seahawks. You may hear a few of them as we head towards the Superbowl. 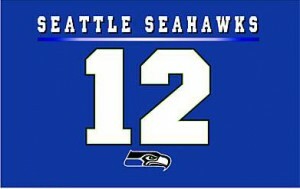 12th man or 12s: There are 11 men on the football field for a team. The Seahawks crowd is so loud and disruptive to the opposing team that it’s like having an extra player, a 12th man on the field. Bigger Faster Stronger Louder: It started as a marketing slogan, but came to represent the philosophical change of drafting college players in the Pete Carroll era and of course the 12th man. Leave no doubt, 24/7: After several players got into trouble with the league for performing enhancing or banned substances, the players called a meeting and declared, “No more mistakes on or off the field.” If you cheat the rules, you allow people to question the team’s success. So, every minute you’re a Seahawk you need to represent the team by making good decisions. Who’s got my back? I got your back. : This is a call and response from the defensive secondary. One guy in the middle of the circle calls, “Who’s got my back?” and the other players declare, “I got your back.” I nice sentiment for a team. We all we got. We all we need. : Another call and response representing team unity. This one with more of an us against the world flavor. Always compete. : This is more of a Pete Carroll thing from his college days. But it plays out on several levels from competing against teammates during practice which makes everyone try harder, to game day, all the time, even when you’re down by 16 at the half or down by 12 with 4 minutes left. Can you win in the 1st quarter? : This is a question Coach Carroll asks his team constantly. Reminding them that it’s not over until the game’s over whether you’re leading or behind. You don’t get wins by being ahead in the first quarter. What’s next? : This is a call made by the team captain in the locker room after a game. It serves as a reminder that you can’t live in the past whether it’s a great win or a horrible loss. Let the past go and prepare for the next game. So, there you have it. You are now ready to converse with anyone about the Seahawks throwing out some choice phrases. Go Hawks.